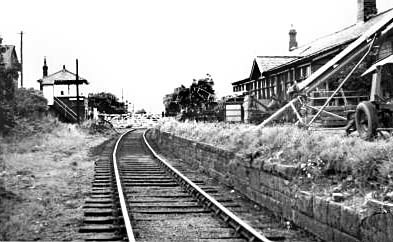 Demolished and replaced with Kenton Bankfoot station (opened 10.5.1981) which occupies the east end of Kenton Bank station site. Notes: When it opened the station (then known as Kenton) served a small community of some 600 people. It was located 3 miles 2¼ chains from the junction at South Gosforth. On 1.7.1923 the LNER re-named it Kenton Bank to avoid confusion with its station on the Mid-Suffolk Light Railway. There was a single platform with the standard station building. It had a single storey with pitched roof containing a booking hall, general waiting room, and ladies’ room. In front was an enclosed, glazed verandah, with a small cross-gable above the door. 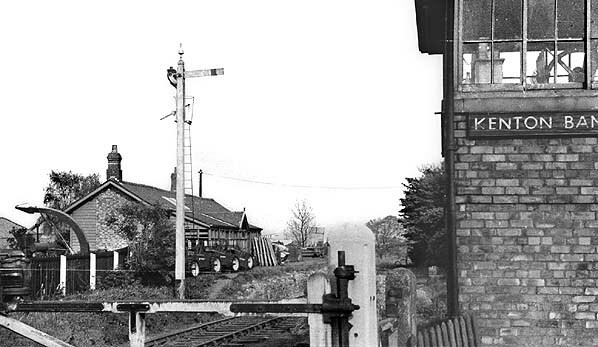 A passing loop was provided, with a signal box at the level crossing. The station was substantially intact 30 years after passenger closure, but was demolished by 1973. After closuire to passengers in 1929 the station remained open for goods traffic until 3 January 1966 although from 20 May 1954 it was downgraded to a public delivery siding. The area of Northumberland lying immediately northwest of Newcastle was served by several colliery waggonways before 1900, but no passenger railways entered it. Under the terms of the Light Railways Act (1896) the North Eastern Railway promoted the Ponteland Light Railway branching from the Newcastle – Whitley Bay route at South Gosforth (then known as Gosforth). Construction began in 1900. The 6¾ mile route was through gently undulating countryside beyond the built-up area of Newcastle, so earthworks were relatively light. electrification was delayed for over fifty years!) Operation of branch services was generally by Fletcher ‘BTP’ locomotives fitted with auto apparatus (based at Heaton Shed). Advertised as ‘steam auto-cars’ these push-and-pulls provided nine to ten services between South Gosforth and Ponteland on weekdays (four on Sundays) taking 20 minutes to complete the journey. By June 1920 the Sunday trains had been withdrawn. In November 1908 the NER deposited plans with Parliament for a 1¼ mile extension to Darras Hall under the name of the Little Callerton Railway. Unlike the parent branch to Ponteland the route was not a Light Railway. The extension was to serve a residential area where development was just beginning. In 1907 Darras Hall Estate began when a group of Newcastle businessmen bought land southwest of Ponteland with the aim of creating a ‘garden city’ for professional and managerial residents. The railway gained Parliamentary approval in 1909, and the Estate entered into an Agreement with the NER on 18 October 1910 for railway access. The single track was largely on an embankment, but there was sufficient space for the addition of a second track should traffic warrant it. 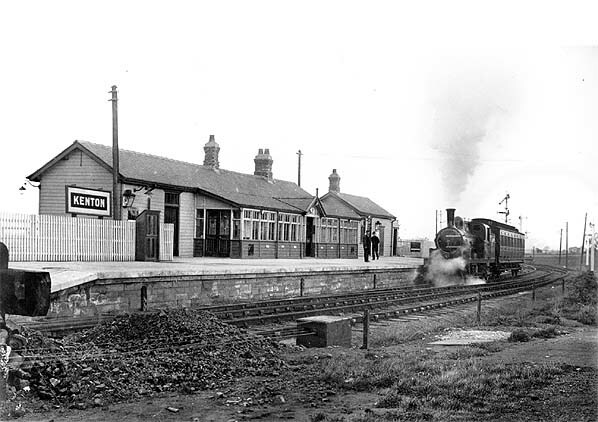 Goods services to Darras Hall started on 27 September 1913 followed by passenger trains on 1 October. The trains operated between South Gosforth and Darras Hall with a reversal at Ponteland: a simple manoeuvre for the ‘auto-cars’. The Darras Hall extension was a financial failure. The estate grew slowly, and its loose grid of roads, with detached houses at a maximum density of six per acre, limited the number of potential passengers. By June 1920 the scanty provision of three trains per day (plus the need to change at South Gosforth) must have served as an additional disincentive to use the service. No industrial development was permitted at Darras Hall, save for the NER goods yard, so even goods traffic was restricted. 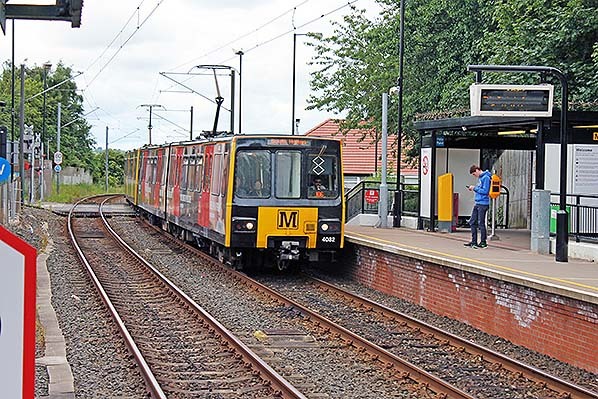 After a gap of over fifty years much of the Ponteland branch regained its passenger trains in 1981 when the route from South Gosforth to Bank Foot (Kenton) re-opened, and was finally electrified, as part of the Metro network. The service was extended to Newcastle Airport on 17 November 1991, which involved a very short branch from the Ponteland route. 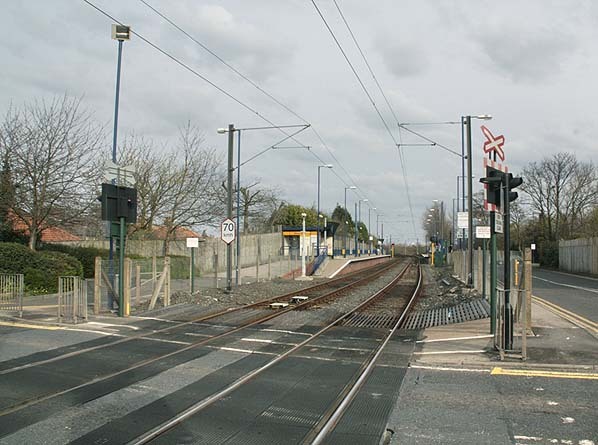 Former station sites at West Gosforth and Coxlodge were occupied by Regent Centre and Fawdon Metro stations respectively, while at Callerton Parkway and Bank Foot Metro stations were sited at the ‘Newcastle end’ of Callerton and Kenton Bank sites. Metro stations at Wansbeck Road (opened 1981) and Kingston Park (1985) were entirely new. The eccentricity of the Darras Hall branch was compounded by its short-lived extension to Belsay Colliery, four miles SSW of Belsay village in the depths of the Northumbrian countryside. The colliery, which opened in 1923 to extract household coal, was operated by Kirkheaton Coal Company. (This firm’s nearby Kirheaton Colliery and Drift closed in 1924.) The workforce never reached a hundred, production was limited, and the colliery closed in 1930. For some of the colliery’s working life, an untimetabled passenger train service for miners was provided on the 7½-mile single-track route for the final mile between Belsay Colliery and a row of miners’ cottages at Wallridge (NZ059768). It is unlikely that platforms were built either at Belsay Colliery or Wallridge. Motive power was an ex-Glasgow & South Western Railway 0-6-0, and there were six trucks, two passenger coaches and a guard’s van. The line was known as the Wallridge Mineral Railway after the almost uninhabited parish where it terminated: the population in 1901 was two. In 1931 there were 37 inhabitants, and presumably all or most of these people occupied the miners’ cottages. The line was not shown on the Ordnance Survey One-inch Popular Edition map (published 1947) but its route appeared on the first Seventh Series Sheet 78 of 1953 as Track of old Railway. 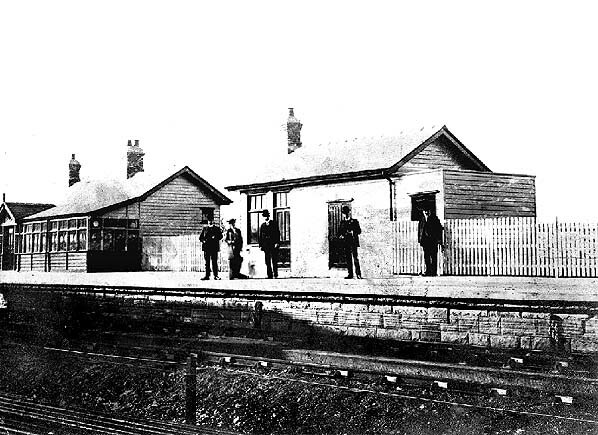 Kenton Station before April 1905. Metro Unit 4082 leads a four car set over Kenton Bank level crossing into Bank Foot Metro station on 26 June 2017. The Metro station occupies the east end of the former Kenton Bank station.